Our Muay Thai Kickboxing Programs will take the very beginner students and have them ready to better defend themselves within minutes. We will sharpen the skills of the most advanced students. We know what works and what doesn’t. Our Roufusport Muay Thai Kickboxing team of world champion instructors and coaches, all certified and led by Duke Roufus, have put together an extraordinary Muay Thai Kickboxing curriculum to help you achieve excellence. Muay Thai Kickboxing is the striking art of 8 limbs. You will learn to defend yourself with Punches, Kicks, Knees, and Elbows. Travel a lot? Don’t worry, we have you covered! The Muay Thai Kickboxing Programs at Fight and Fitness MMA are part of an MMA network. You may also train at any Roufusport academy worldwide, including headquarters with Duke Roufus. Muay Thai Kickboxing Level I (Pad Work & Muay Thai Heavy Bags): this class is an introduction to the art and an enjoyable training session that will get your heart rate pumping. You’ll be working hard, but you’ll be having fun and building confidence. You will learn proper technique on various pads through repetition and have a great workout. Muay Thai Kickboxing Level II (Pad Work & Partner Drills): you will warm up with pads and then drill moves with a partner. You’ll use everything from fundamentals and learn to apply it practically on a real person without the danger of actually fighting. You will gain new skills by reacting to certain situations and chaining together effective attacks and defenses. This class is open to everyone and highly encouraged even for beginner students. We will pair beginners with beginners, and the more advanced students will take it a few steps further. Everyone will learn appropriate skills for their level. Contact: Safe minimal to controlled contact. *Proper Gear is Recommended but not necessary. Muay Thai Kickboxing Level III (Partner Drills and Sparring): is an exciting class where you will exchange techniques during partner drills and live situations. You will get a feel for what works in real life by applying your moves on a resisting opponent. You will learn advanced combinations, setups, counters, and strategies. This class is open to only advanced students and you will need instructor permission to join this class. Contact: Moderately controlled to full contact. 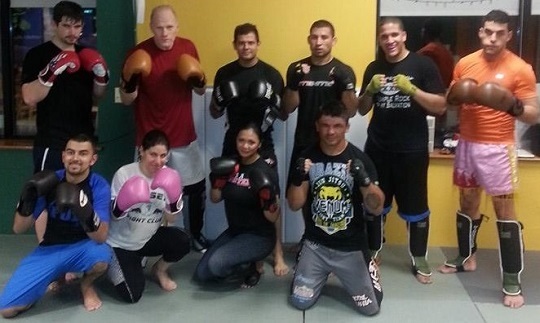 Roufusport Kickboxing is under the direction of Duke Roufus. As a member of Fight and Fitness MMA, you will also be in the family of Roufusport and learn the same techniques fellow Roufusport students (such as Tyron Woodley, Alan Belcher, and Anthony Pettis) used to become UFC Champions. You may also train at any Roufusport academy worldwide, including headquarters with Duke Roufus. Sign up for an introductory lesson today!